Backpackers.com — The Cairn box is one of the best outdoor-focused subscription boxes on the market. Below we review the service, go over the features, and help you decide whether or not you want to subscribe. The short answer: yes, for a little while. For the long answer, a full description of Carin’s services, and our review of sample boxes, read below. The Cairn Original Box, a monthly subscription, delivers unique products to your door. Cairn sent us two months of Original Boxes to get a sense of the service, and we have tracked the company for the last two years to see how they perform, and what the outdoor community thinks. Overall: people are happy. There’s nothing quite like receiving a small box of mystery outdoor goodies once a month. It brightens the stoop, reminds you to get outside, and scratches that gear junkie itch most of us have. Cairn breaks down their included gear into 5 categories: Gear, Apparel, Food/Energy, Skin Care, Emergency/Medical. These categories fit for outdoor gear, but do not expect to receive all five categories in a single box. Our of the two boxes we received, one had four items, the other had three. The number of items depends on the relative cost of each item in a box. All the items we received in two Cairn boxes. Newsletters included. Gobi Gear 20L SegSac: An awesome sub-divided stuff sack that helps organize your packing. Excellent for non-minimal backpacking. HumanGear Gobites Duo: One of the better spoon/fork tools on the market. Compact, light, and durable. We’ll be using this. FixnZip Zipper Repair Kit: Great to have around, but only something you’ll need when you need it. If you don’t have a broken zipper now, it’ll sit in storage. Also, most outdoor brands fix broken zippers as part of the warranty, so not 100% useful. Gomacro Macrobar: Organic, vegan, non-GMO, and delicious. A bar will get eaten, and a clean-foods, raw bar will get eaten first. The items in the March 2018 Original Box by Cairn. Packtowl Luxe Towel: The largest quick-drying towel Packtowl offers. Comfy, excellent for travel, but too large for backpacking. Makes the perfect travel and camping towel. Tyny Tools Key Clips: Two simple clips that can be used as bungees, tie-offs, or to hold most items. While we find them interesting, it’s more of a “cool, how should I use this?” item, than a “yes, I’ll use this!” item. Viter Energy Mints: Caffeine-laced breath mints. Kind of odd, but can clutch for those who want good breath and a boost of energy in the woods. The items we received in the May 2018 Original Box. There’s usually one or two “large” items, a small handy item, and a food or supplement. This diversifies each box. Every box will likely come with a clutch item, like the Packtowl — something you’ve been eyeing or would have bought if you were treating yourself. This item really makes it worth it, and the other items might be perfect for you, or you might regift them to a friend. This Gobi Gear SegSac was the clutch item in an Original Box. Ingenious for those that want to pack neatly. The brands are interesting. Cairn does an excellent job of fostering strong relationships with brands large and small, and it makes for an interesting mix. Packtowl is well-known, Gobi Gear less so, but both items were awesome. Fancy wrapping paper found in the Cairn box. You probably would not buy these for yourself. The beauty of Cairn is that it gives you permission to use and explore new products you never would have found or bought for yourself. If I needed a micro-fiber towel, I probably never would have gotten the largest, most expensive PackTowl. But, hey, it’s in the box. Will our staff use it? Of course. Some items are great, some are just OK. This will vary for every person and their interests, but we found the majority of the items in these boxes to be excellent, surprising products. We also thought some of them weren’t that useful, or that we’d have to go out of our way to find a use for them. Thoughtful Touches. 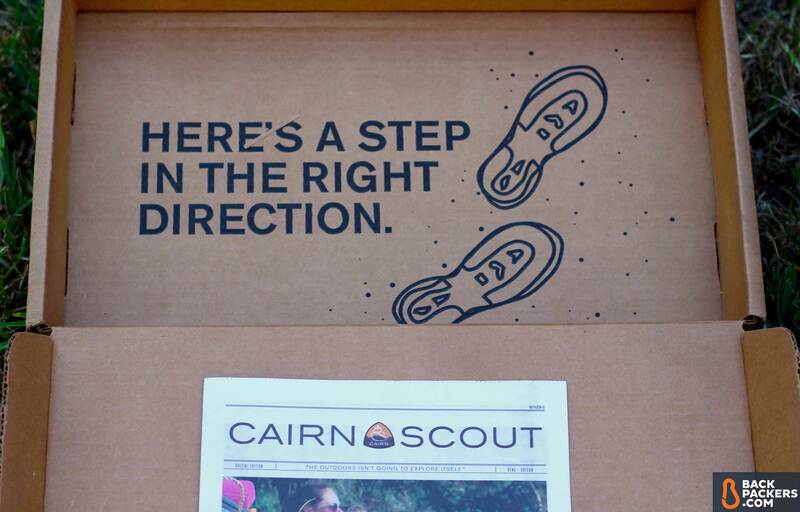 Cairn also includes a small newsletter in each box, wrapping paper, and the box itself has some charm. These go a long way towards customer satisfaction and anticipation. The newsletter in particular provides a bit of info on the gear, discounts to other brands, and alerts for other opportunities as a Cairn community member. Playful messages on the boxes and a small newsletter on the items you’re getting (and other Cairn offerings) are a nice touch. Cairn’s boxes of gear are the cornerstone of their platform, but as the company has grown they have launched other interesting initiatives as well. The Original Box: A monthly box with up to $50 in gear, costing roughly $28 per month (depending on how many you pay for in advance). This is what we received and reviewed above, and what most people are familiar with. The Obsidian Quarterly Box: A quarterly box (4 times per year) with $300+ in gear, costing roughly $250 per quarter. This is a much more costly option, but includes much more costly gear. Sleeping bags, backpacks, solar chargers, sleeping pads, and down puffies have all been seen in the Obsidian box. The Obsidian box is also tailored to your specific interests, so you are sure to end up with items you’ll enjoy. Cairn does this through a profile survey, which asks questions to help determine your unique package. Cairn is all about giving perks to its subscribers. Once you subscribe, Cairn lets you leave reviews of the boxes it sends, and each penned review equates to points. Get enough points, get a free box. This sort of system keeps you linked in with the brand, encourages people to use and comment on the products they receive. By being a Cairn subscriber you are automatically entered into the company’s Monthly Adventure Upgrades program. This is a chance to win new, exciting gear from some excellent brands. It’s a bit like being perpetually subscribed to a monthly gear giveaway, and the prizes are really good. Should You Subscribe to a Cairn Box? This is the real question. In our opinion, yes, the Original Box is worth trying. Even if you’re a dedicated gearhead with tons of gear, there are cool items and brands that show up in these boxes you would have never known about, and because the items are relatively small, they make excellent gifts if you can’t use them. But where Cairn really shines is for outdoor-lovers that don’t have an entire garage full of gear. Subscribing to the Monthly Box will build up a collection of cool gear to try out; subscribing to the Obsidian Box, even for a single quarter, will provide you excellent gear without the hassle of researching and shopping yourself. The quality of gear in either subscription is top-notch. Finally, if you have an outdoor-lover in your life, consider the gift of Cairn. Nobody will refuse a few months of outdoor gear delivered to their doorstep. All that said, if you’re a discerning, research-based shopper Cairn’s platform may be too much of a broad stroke for you. After all, you can’t pick what you receive, and it does cost money you could spend on campsites or very specific gear you know you want. Backpackers.com Affiliate Policy: Cairn sent Backpackers.com two Original Boxes, and this article contains affiliate links, which help fund our website. When you click on the links to purchase the gear we get a commission, and this goes a long way to creating guides, gear reviews, and other excellent content. The opinions expressed here are our own.